March 16th, 2012. Abington Heights vs. Boys’ Latin Charter at Parkland High School in the Pennsylvania state playoff quarterfinals. Abington lost a nail biter 77-72 in overtime. That game was the first time I got to see Maurice Watson Jr. play in person. 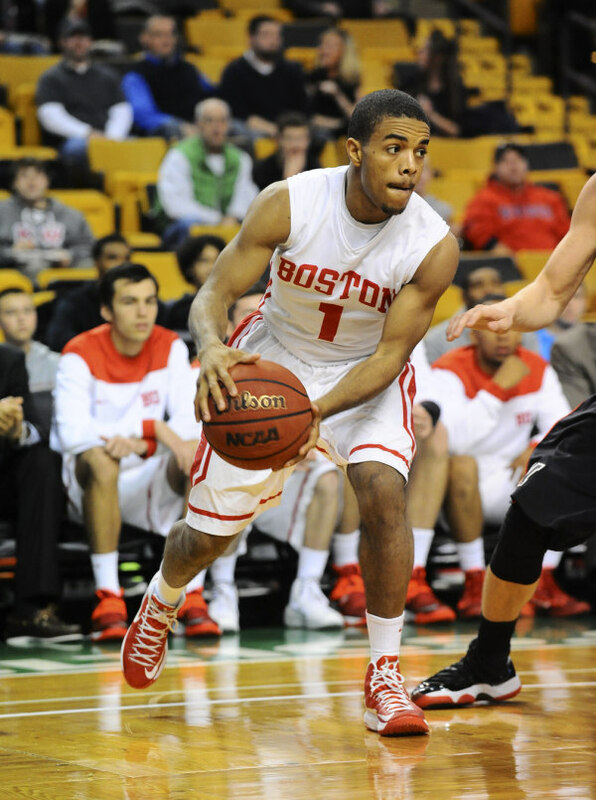 Maurice Watson Jr. was the starting point guard for Boys’ Latin Charter. He was ranked as the 92nd best recruit in the country by ESPN. 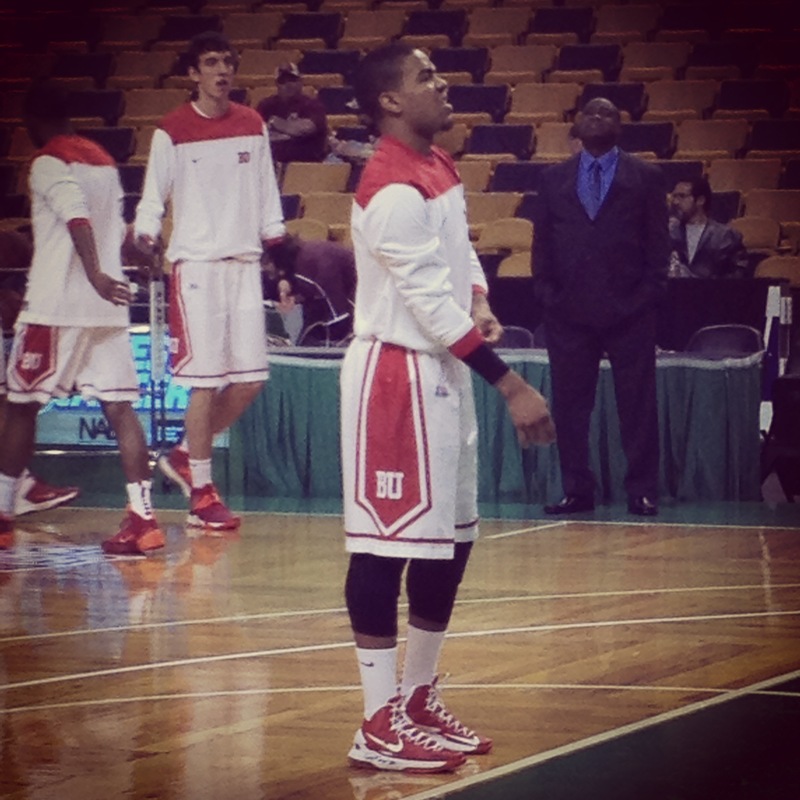 I had known going into that game that he was heading to Boston University in the fall. I also knew that he was going to probably blow past every kid on our team. Every scouting report made two things clear: He was fast and could score. I had a front row seat for his showdown with JC Show, Abington’s best player. In the picture above you can see my legs (white shorts, leg brace on the right leg) at the end of the stands where I watched the game. I was terrified of Maurice going in. Then I saw him play. That’s when I realized this guy was the real deal. He scored 14 points that night while acting as a five star floor general. Needless to say, I left impressed. I didn’t realize that this game would change my life over a year later. 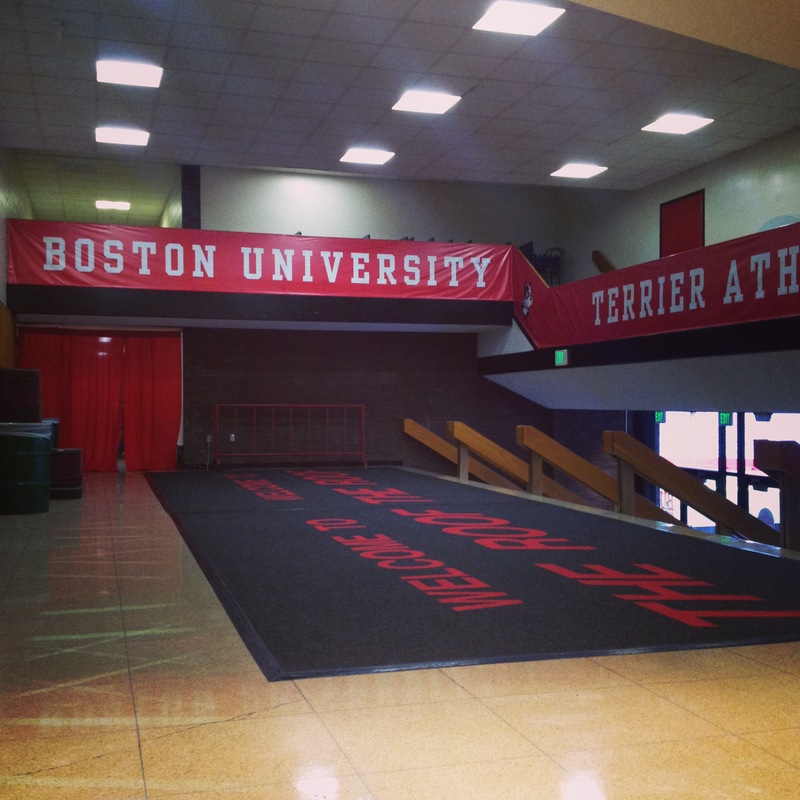 Earlier this year I wrote about finding Boston University as my new home. 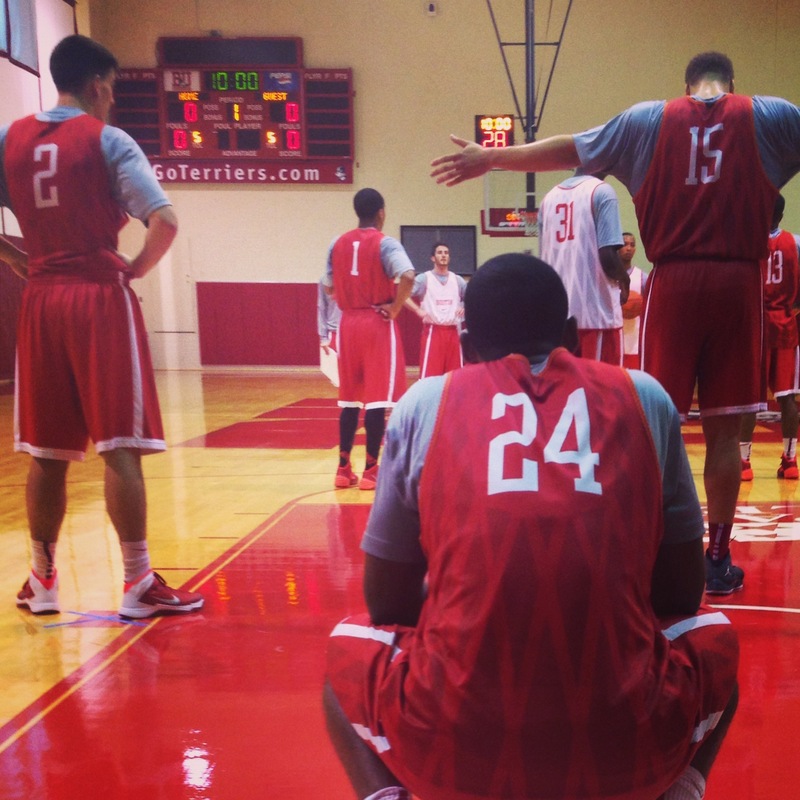 Once on campus, I had a goal in mind: Become a part of the basketball culture at BU. 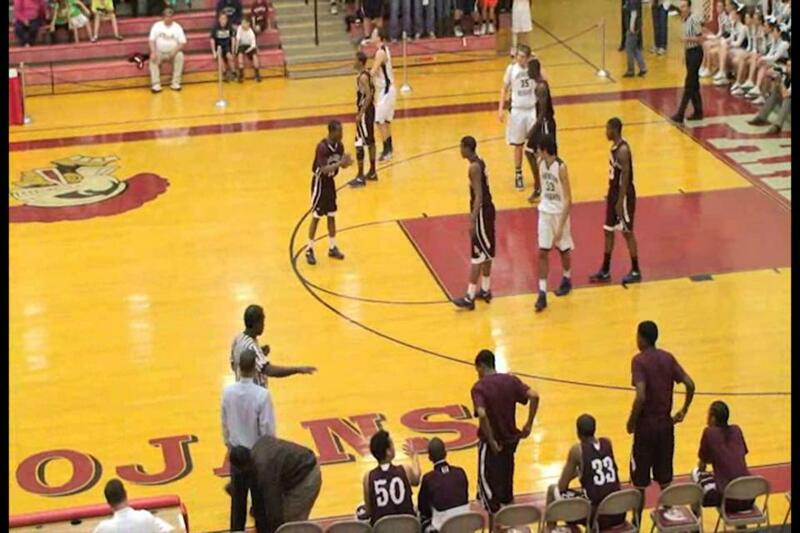 At Abington Heights I worked as the PA announcer for the boys and girls teams for two seasons. To say this was fun would be an understatement. It was one of the happiest times of my life. I got to watch incredible games from the best seat in the house and add into the atmosphere at the game. I loved my job, and fully plan on announcing some more games in the near future. I was teary-eyed leaving that job. I knew that when I came to BU I wanted to be in the basketball culture somehow; I didn’t care if it were just as a fan or maybe knowing someone from the team, it just had to happen. September 7th, 2013, when I’m heading back to my room from the Warren Towers dining hall, I run into Maurice Watson Jr. and James Kennedy. I stop them and introduce myself. As soon as I mention Abington Heights, Maurice immediately remembers the game a year and a half earlier. He remembered JC (who, it should be noted, gave his all trying to beat Boys’ Latin Charter, scoring 33 that game) and mentioned that he was hoping he’d join BU’s team next year. I told him that, ironically, he committed to Bucknell meaning in 2014 there would be a rematch between Watson and Show. We both were excited. I exchanged numbers with both guys and headed back to my room. This ranks among one of the nicest things anyone has ever said to me. I knew in that moment that James was a great guy. He’s a junior forward for BU and a stand up human being that I am proud to call my friend. That week, Maurice and I had lunch together. While there, Maurice told me about his family; how he has worked for what he has today and how he looks after those he is close to. After that day, I have respected Maurice more than almost anyone on this planet. So for the month of September I got to make some new friends on the team, more than exceeding my goal. 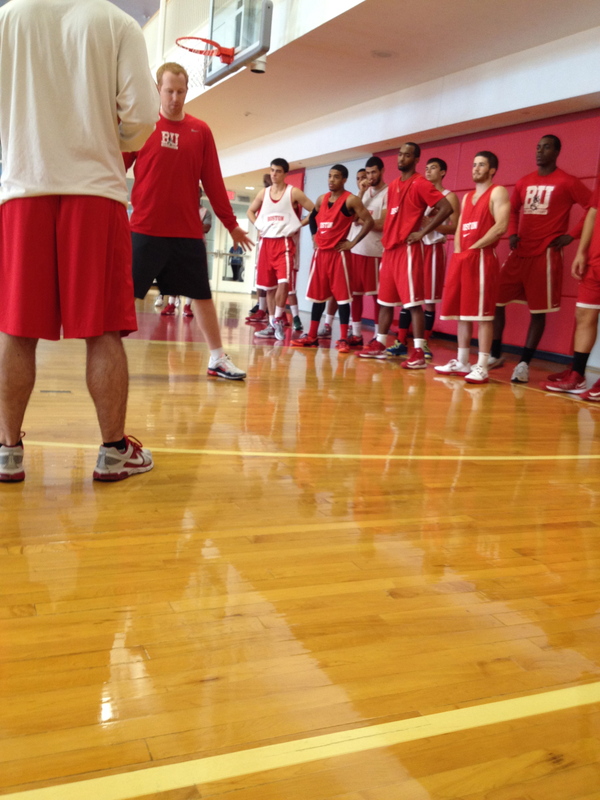 September 29th, 2013, Boston University basketball kicks off their practice schedule. Maurice had told me to come to the practice a few days earlier. When I came, I met everyone else on the team, all the assistant coaches, managers, and personnel. At the end of practice Maurice called me over to meet head coach Joe Jones. From the moment we met, I knew that Coach Jones was an awesome guy. I have not been proven wrong. He immediately told me that I was welcome to practice whenever I wanted to come. With green light, I started coming more and more; director of basketball operations Joe Bianco actually gave me the official schedule. Gradually I became friends with a bunch of the guys on the team. I started to feel like I belonged there. November 10th, 2013, the night before the season opener for the team. By this time, I had been told that I was one of the guys by a few of the players. Hearing that made me happier than words can express. I decided to send a message to the guys the night before to try and get them excited. Even though this text was sent to me a few days ago, I still get choked up reading it. Allow me to explain why something like this means so much to me. I grew up obsessed with sports. I love everything about them. I watch ESPN at an unhealthy rate. There is nothing I like more in life. The problem has always been my bones. With osteogenesis imperfecta I was never able to play on any sort of organized team. I missed out on an experience I desired more than anything. I lived vicariously through friends of mine who played basketball and football in high school. I wanted to be part of the team. Now I have guys telling me I am part of the family. Blessed isn’t putting it strongly enough. I’ve never wanted something more, and now it’s here. These guys truly have changed my life. 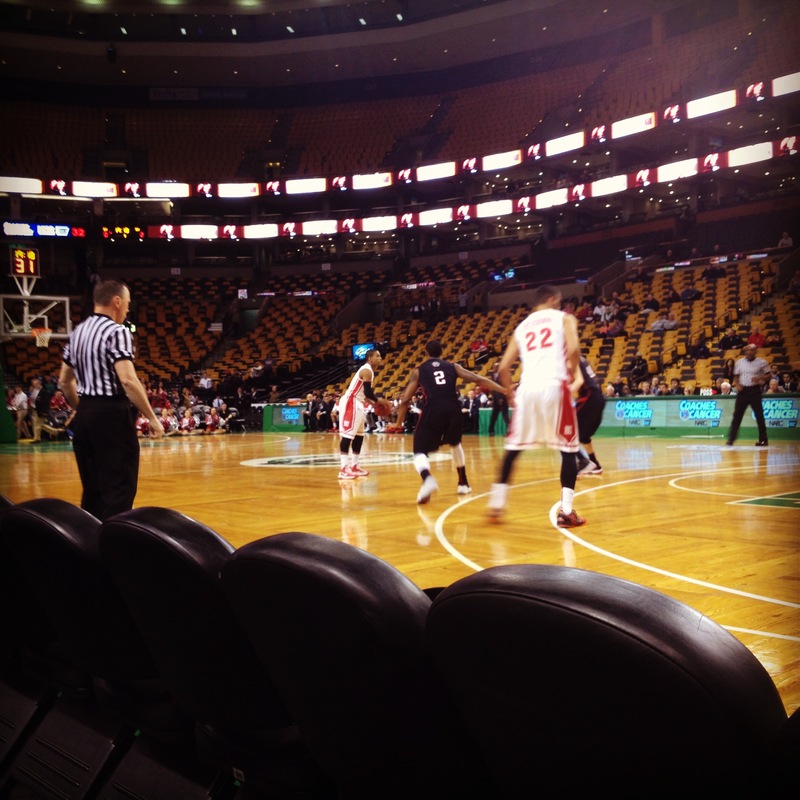 The next day the team played our rival Northeastern at the TD Garden. I sat in the front row because of course I did. There are better write-ups of the game from places like ESPN and the Boston Globe, however I was witness to John Papale getting clutch buckets to cut the NU lead, Maurice hitting a dagger layup with second remaining and Malik Thomas getting the single most unbelievable steal I’ve ever seen in my life. 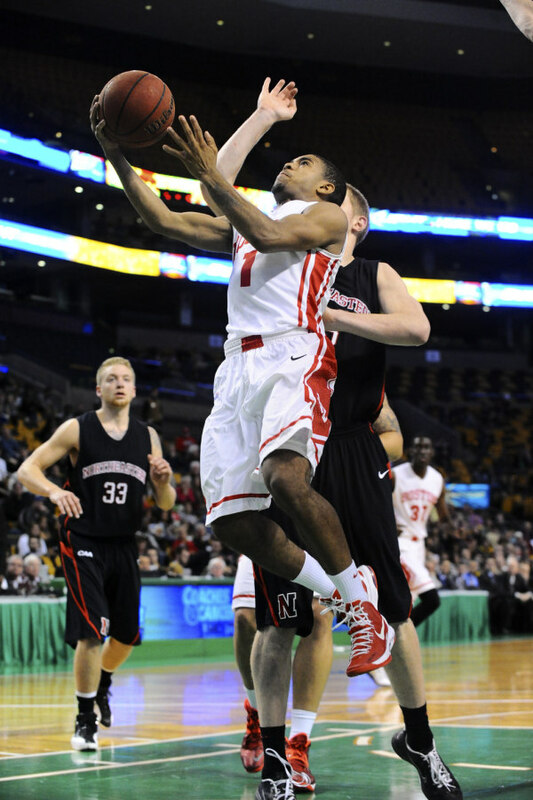 With three seconds to go, Northeastern was inbounding under their basket down one. Malik was covering the inbounding passer. The kid throws the pass right into Malik’s hands. He was no more than three feet away. I’m in shock that the kid from Northeastern couldn’t fulfill the one thing you aren’t allowed to mess up: don’t hand it over to the guy right in front of you. DJ Irving hit two layups to seal the win. Maurice had a great game, scoring 16 points with four rebounds and five assists. That’s not my favorite part though. Back when Maurice and I had lunch, I found out he and I have the same shoe size. I showed him a picture of a customized pair I made last December when I got into BU. His eyes lit up. He had a plan. 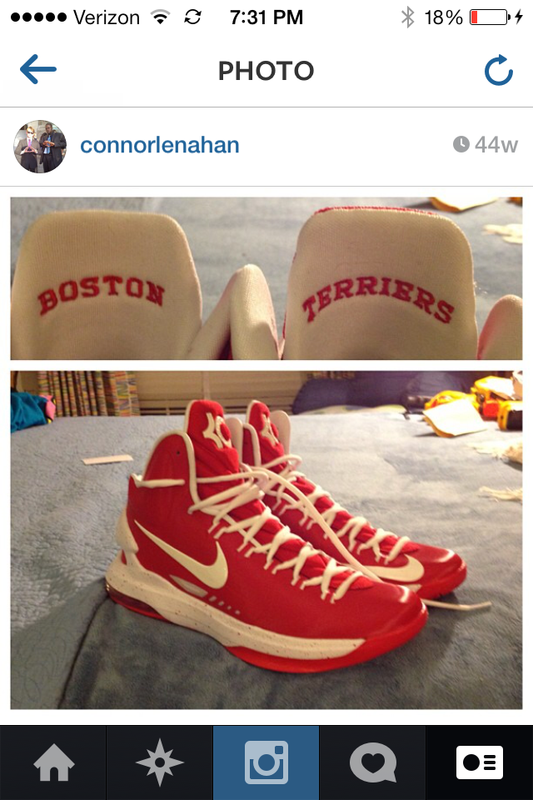 He told me that he was going to have me sign the shoes on the outside white and he’d wear them against Northeastern. He kept his promise. I almost died. This story is for my family. This is me again thanking them for taking me in with open arms and making my world a better place every single day. Now we are just entering the season, and I am excited beyond belief. This is for Maurice Watson, John Papale, Eric Fanning, Blaise Mbargorba, DJ Irving, Braiten Madrigal, Dom Morris, Cam Curry, Ced Hankerson, Nate Dieudonne, James Kennedy, Travis Robinson, Dylan Brossman, Malik Thomas, Justin Alston, Dylan Haines, Joe Jones, Curt Wilson, Shaun Morris, Carmen Maciariello, Joe Bianco, Fran Brown, Adam Hood, Maiya Dempsey, Maddie Bahr, Harry Fotopoulos and everyone else BU basketball. All of those names are family to me. I love them. We are a few weeks away from Thanksgiving, and I’ve never been more thankful for anything in my life. ← When You Start a Band, Do You Imagine How It Will End? season for all! K,S and OMalley! Aww, that was a really beautiful article; I’m tearing up! Thanks for sharing, Connor. We need more fans like you! Connor……I don’t know if you remember me. I was a substitute teacher at AHHS for 10 years. (Mrs. Fischbach) This article made me cry! I am so happy for you. Keep up the good writing, and I hope I get to read more of it in the future. And I’ll try to watch some BU games here in Korea if I can (I’ve been living in Seoul, Korea since March, 2013). Take care of yourself. You ROCK!!! Connor, I don’t know if you remember me, but I was a substitute teacher at AHHS for 10 years. (Mrs. Fischbach) I am so impressed with your writing, and also this story. It brought tears to my eyes. Reach for the stars, kiddo! You Rock! I’ll try to watch some BU basketball games here in Korea if I can. My husband and I moved to Seoul in March 2013. Take care!